Note: this blog post is part of a Pacific Northwest blogger scavenger hunt! Answer a series of questions while learning about some great northwest nature blogs and try to win a prize! Read this post for details on how to participate. You have til Sunday night (Aug. 28) at midnight to enter. Moments of quiet are rare during the week of 4th of July on San Juan Island. It was early morning at Lime Kiln Point State Park and the tranquil waters mirrored the sky, calm enough that you could hear the harbor porpoises breathing as they surfaced a quarter-mile offshore. I sat at a picnic table with my journal. There were a few other people scattered along the shoreline, but all were engaged in similarly personal activities, everyone taking in the beautiful morning in their own way. 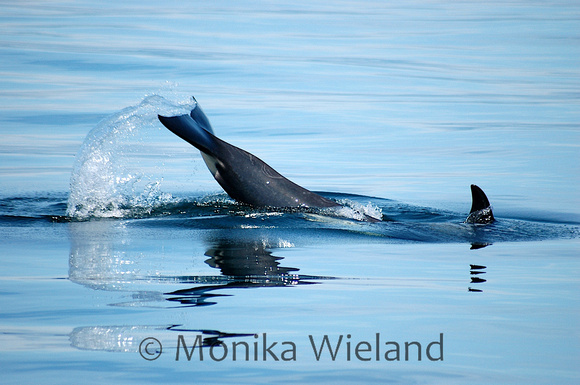 A blow much louder and longer than that of a harbor porpoise broke the silence. That was signal enough to abandon everything else, grab the camera, and head to the shoreline. I climbed down to my favorite rock in front of the lighthouse, as low to the water and as close to the whales as you can get. Even as more people gathered on the rocks above me in anticipation, from down at the water’s edge I can block out all other distractions. It can be just me and the whales, and that’s how it felt that morning. In the lead, as they often are, were J1 Ruffles and J2 Granny, a little further offshore and well ahead of the rest of the pod. This meant J-Pod, who had spent the last several days in Rosario Strait, had looped around into Haro Strait during the night. Behind Ruffles and Granny came J8 Spieden, her wheezing blow especially noticeable. I immediately started looking for her granddaughter J19 Shachi, who a couple of days before had been reported with a brand new calf. Everyone who saw J41 on that first day commented on how small she looked, so I was anxious to see if she was still with Shachi. Shachi had lost her first calf, J29, in 1992. 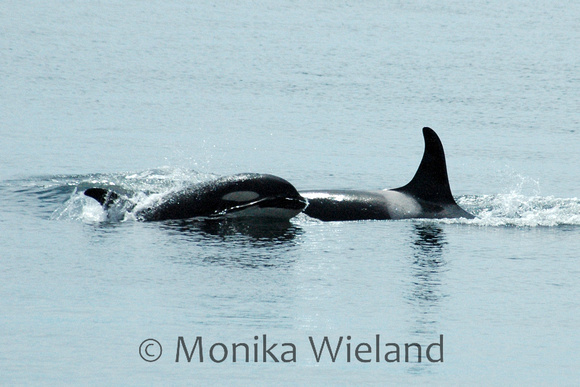 Sure enough, Shachi wasn’t far behind Spieden, and popping up just beside her was the smallest orca I have ever seen. 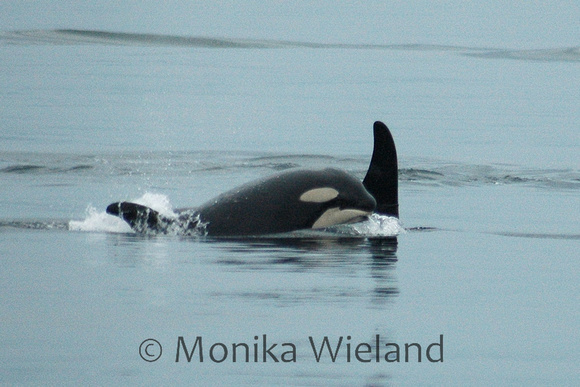 Still the bright orangey color typical of a newborn, J41 also had visible fetal folds on her forehead and down her back. Though she must have been the typical five or six feet long of an infant, she was dwarfed next to her adult mother, her tiny curved dorsal fin just a fraction of the height of Shachi’s. 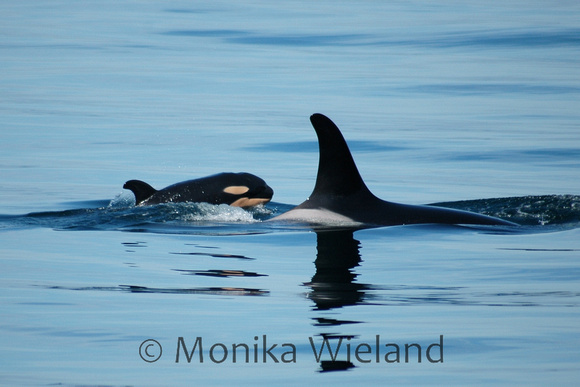 The mother and calf surfaced together three times in front of me, and on the last dive Shachi gave a tail slap, her flukes disturbing the flat-calm water, almost as if celebrating the arrival of her new daughter. Most people seem to form a special bond with one particular whale, a whale with which you have numerous significant encounters, and that whale for me became J41. So small, so vulnerable, yet so full of life, J41 was a symbol of hope for a population on its way to being listed as endangered later that year. I had seen other calves, but there was something about the connection that was forged that morning that moved me, studying to be a scientist, to poetry to try and capture what I had experienced. She came back in 2006 having grown a lot, now the traditional black-and-white color of a killer whale having lost her baby pink. 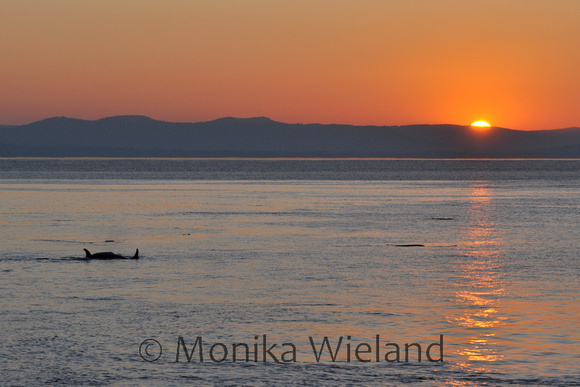 On her first birthday I saw her alongside Shachi leading a superpod through Haro Strait, and later in the summer she was named Eclipse through The Whale Museum’s Orca Adoption Program. 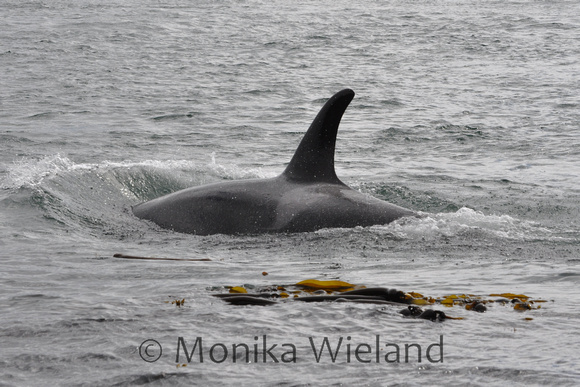 One of the amazing things about this population of killer whales is that the same animals return year after year, and they are all individually identifiable, which means we get a rare opportunity to watch individuals and families change and grow year after year. Every spring, I anxiously look for Eclipse to see how much she has grown over the winter. One summer I was on a whale-watching boat when a young calf surfaced by itself behind our parked boat, excitedly lunging in all different directions. It took me a moment to recognize Eclipse, now aged three, who proudly spyhopped with a small fish in her mouth. A moment later Shachi came over to collect her calf, and the two swam off together. Another time I was on a kayak trip with some friends off the west side of San Juan Island. 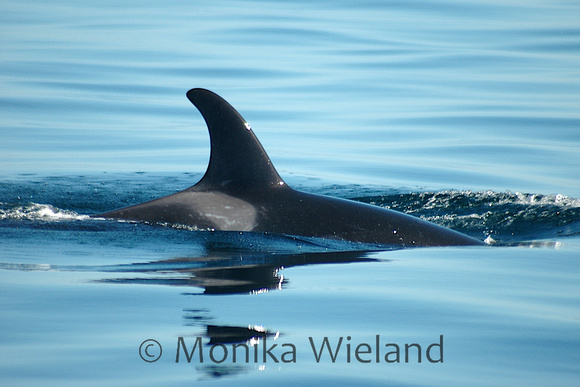 We had no sooner launched our kayaks and pulled into a kelp bed than we were circled by Shachi and Eclipse. Even though she was only a few years old, it’s amazing how much bigger Eclipse looked from the perspective of a kayak, as this time I felt I was definitely a visitor to her world, rather than watching from the shoreline or from the deck of a boat. This year, I really couldn't believe how big Eclipse had gotten! 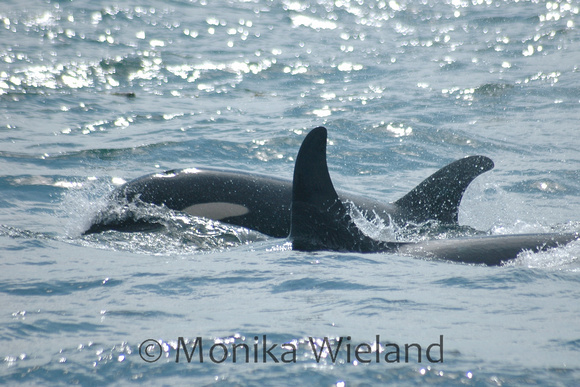 I hardly recognized her next to her mom, though her dorsal fin is starting to show the same characteristic hook as Shachi's - a true mother-daughter resemblance. To view a photo gallery of Eclipse photos, including the ones featured on this blog post and more, click here. 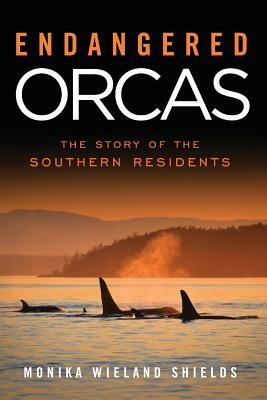 I always enjoy your images and the information about each whale. I love how you identify with each whale.